Should You Sell Your Precious Metals to Buy Bitcoin? There is a new trend by individuals in the alternative media community who are now selling out of precious metals and buying into Bitcoin and cryptocurrencies. While this may seem like a good idea, especially when Bitcoin and the cryptocurrencies reach new all-time highs, it is likely a big mistake. Now, I am not saying that individuals shouldn’t invest in cryptocurrencies. Rather, it’s a lousy idea to sell all of one’s precious metals holdings and put it all into Bitcoin and cryptocurrencies. I have to tell you, not only do I find this sort of thinking, utterly preposterous, I also find it quite troubling that analysts who have been promoting precious metals for the past decade are now implying that gold and silver are no longer high-quality stores of value. I disagree entirely with this faulty and superficial analysis. There are several reasons why I believe it is essential to hold most of one’s wealth in precious metals than in Bitcoin and cryptocurrencies. However, the most important factor has to do with the fragile nature of a highly technical complex system that allows Bitcoin and cryptocurrencies to function. It takes a tremendous amount of energy to maintain and power the internet, servers and computer systems that give life to Bitcoin and cryptocurrencies. Unfortunately, the majority of the alternative and mainstream media analysts believe in the ENERGY TOOTH FAIRY ( a term coined by Louis Arnoux). What do I mean by the ENERGY TOOTH FAIRY? It is the belief by a significant portion of the public and analyst community that the advanced world economies and markets will continue to prosper and grow forever. Moreover, some analysts, such as Harry Dent, believe that if we got rid of the corrupt bankers and politicians and allow people to have a lot more babies, then economic growth will continue indefinitely. For some odd reason, Harry Dent totally omits the impact of energy in his demographic analysis of the markets. Does ole Harry not realize that the exponential increase in global oil production has coincided with the exponential growth in human population??? Of course not. If he did, he would stop focusing on demographics and place his attention on what is happening in the global energy industry. Regardless, selling out of one’s precious metals holdings might be unwise if we consider that the price of gold and silver are closer to their lows, and Bitcoin and the cryptos are reaching new highs. 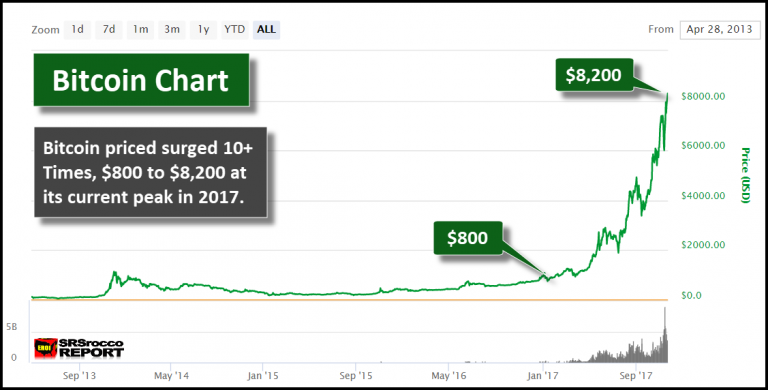 One year after Bitcoin hit $1,150, it was trading at $250. It took nearly three more years before Bitcoin surpassed its previous high. 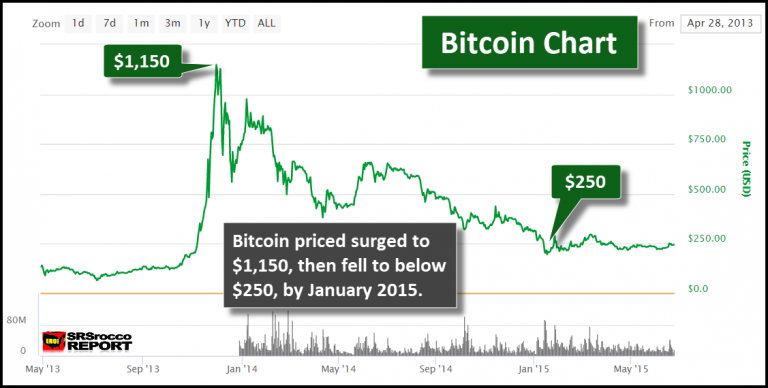 Will this happen to Bitcoin again? Who knows? It is almost impossible to gauge the value of Bitcoin and the cryptocurrencies. Yes, we could see Bitcoin continue towards $10,000. However, we must realize that most people are not getting into Bitcoin because they understand the potential benefits of blockchain technology, but rather because the price is surging higher and higher. There’s nothing like a skyrocketing price to bring in the speculators in huge numbers. Recently, Mike Maloney of GoldSilver.com stated in a video that he took some Bitcoin profits and purchased silver. He believed that it was smart to take profits from Bitcoin as it looked like it was potentially overvalued and buy silver as it was undervalued. I agree. As I stated at the beginning of the article, individuals who believe in a new high-tech world with Bitcoin and cryptocurrencies running the monetary system must have forgotten about our dire energy predicament we are facing. This baffles me. The U.S. infrastructure is falling apart while North American suffers from over 250,000 water main breaks a year, and we are going to transition into a new high-tech world of robots and cyborgs? Who are we fricken kidding? Has anyone taken a good look at what happened to the Great Egyptian, Mayan and Roman Empires??? They PEAKED and DECLINED… LOL. And it was all based on their Falling EROI – Energy Returned On Investment. The more advanced and complex a society becomes, the more energy it takes to run and maintain it. Folks, we have run out of our CHEAP, ABUNDANT ENERGY. 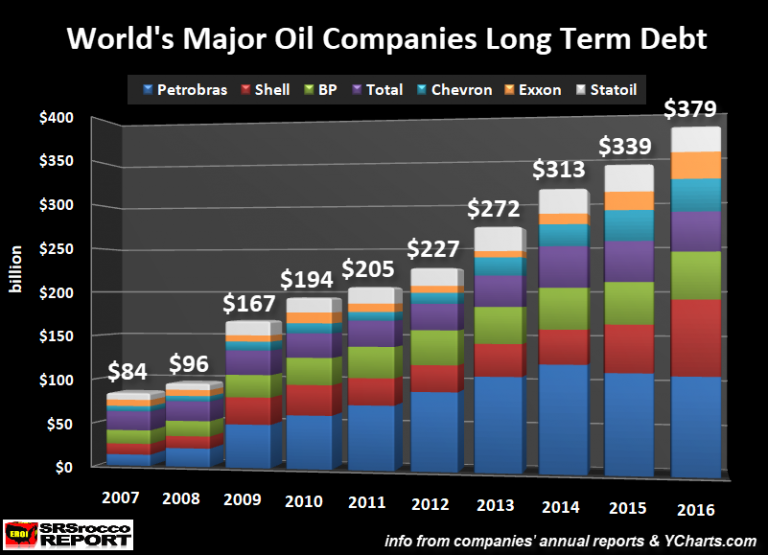 The global major oil companies long-term debt had quadrupled from $84 billion in 2007 to nearly $380 billion last year. Why did their long-term debt increase when they were enjoying $100 a barrel of oil from 2011-2014?? The problem is that Falling EROI is now pushing costs higher as the net energy in a barrel of oil declines. Thus, we have a double-edged sword. 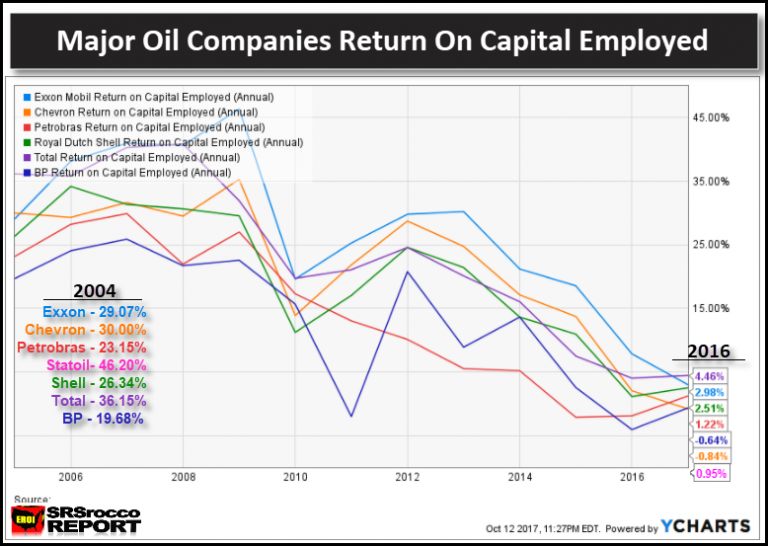 In 2004, these top seven global oil companies enjoyed a Return On Capital Employed (ROCE) between 20-40%. We must remember, that year the price of oil was $38. However, when the oil price was higher at $44 last year, these companies ROCE fell to the low single digits. Thus, they return on capital employed collapsed. 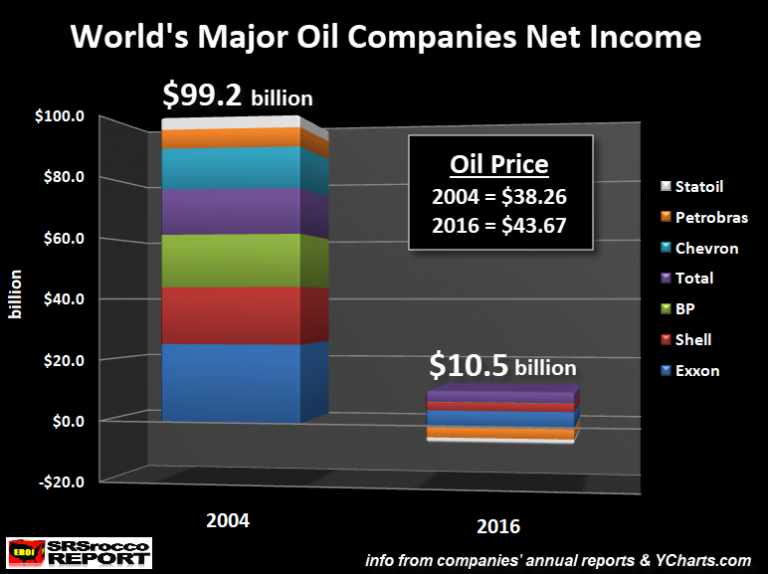 These three charts paint a very grim future for the global oil industry. Without the burning of oil, our economy grinds to a halt. I would like to remind those who believe WIND, SOLAR, and ELECTRIC VEHICLES are going to save us… they are nothing more than fossil fuel derivatives. The world needs to burn a lot of oil, natural gas and coal to produce the so-called renewable green technologies. So, when oil and natural gas supply declines, so will the delusion of renewable energy. Now, I am not saying it isn’t wise to own solar panels on one’s home or to have an electric car. Instead, it’s unwise to believe solar, wind, electric vehicles, and a new high-tech world is our future. I believe we are going to experience one hell of a market crash and deflation. Not only will the oil price drop like a rock, but so will the value of most STOCKS, BONDS, and REAL ESTATE. If you have sold your precious metals for cryptos at this time, you may find out that was a big mistake.